Are you looking for convenient and secure boat storage near the Tennessee River with extended hours and access? Metro Self Storage offers exterior parking spaces for boats and RVs to meet your boat storage needs. Thanks to our ideal location off I-140 and Highway 129, trailering your boat to and from of our Alcoa boat storage facility is fast and convenient. Our easy-to-reach location means you will have better access to major highways and popular destinations in and around Knoxville, Tennessee. With flexible month-to-month terms that allow you to store your vehicle for as long as you need, you can choose to store your watercraft in between weekend getaways or use our facility for winter boat storage. After a fabulous fishing trip, enjoy conveniently located boat storage at Metro Self Storage near McGhee Tyson Airport. We know that worries tend to vanish when you are on a boating vacation, so we strive to make your boat storage experience just as worry-free. We invite you to reserve your space online or to contact us today to learn more about our Alcoa boat storage facility. Our Alcoa boat storage facility is a meticulously maintained property that offers ample lighting, extended gate access hours, and 24-hour security. 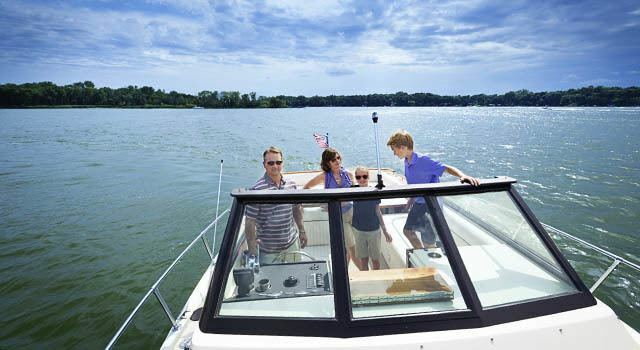 Our customers enjoy wide drive aisles designed to help you maneuver your boats and trailers to and from our property. Additionally, a friendly, on-site Property Manager is here to give our customers peace of mind.